Say goodbye to muddy paws forever! No more dirt areas or holes in your yard because of your dog digging either. 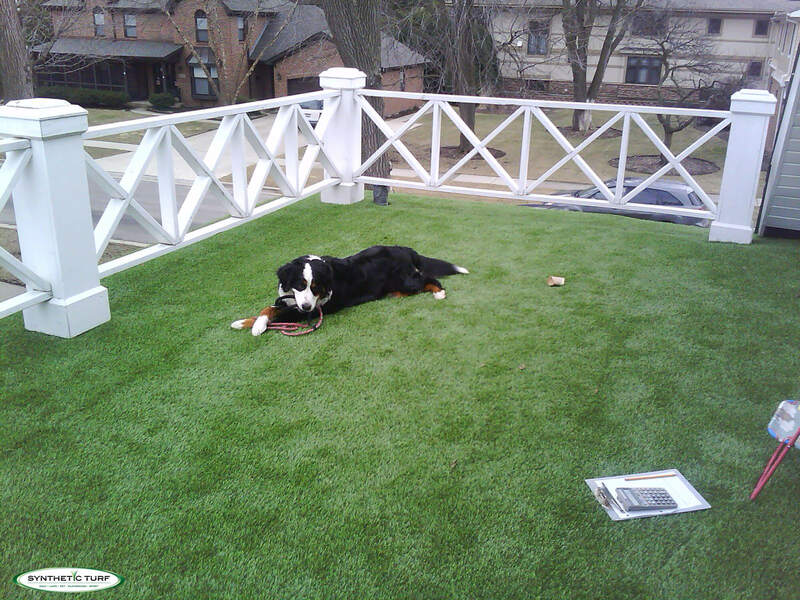 Synthetic Turf of Illinois offers incredible turf products just for dogs. 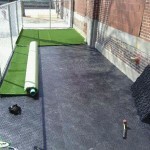 Our turf is 100% permeable, unlike other turfs that only have drain holes every 4”. We have yet to meet a dog that has aim that good! 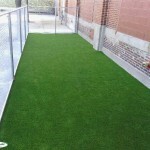 Our pet turf is perfect for the side of the house, a kennel, doggy day care, boarding facility or the entire yard. Your dog cannot tear this turf up and it is easy to disinfect and deodorize. We offer multiple pet turf options along with optional anti-microbial infill to filter the urine as it pass through it. All of our products are safe to use with your pets, but for areas just for dogs, we choose to use synthetic fibers that are shorter in pile height than our lawn products for easier clean up. They also have our patented, recyclable, geo-textile fabric that provides for maximum drainage. All of the products are UV protected, drain better than any others and include a 10-year warranty. Your dogs cannot tear this turf up! The turf can be cleaned with the Simple Green product to disinfect the turf along with a leaf rake to remove debris. 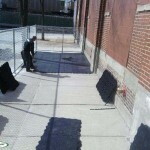 The fibers are water and urine resistant and our technicians are trained to install your new dog run or entire yard with proper drainage and seaming where necessary. The difference is in what’s “under” the turf! 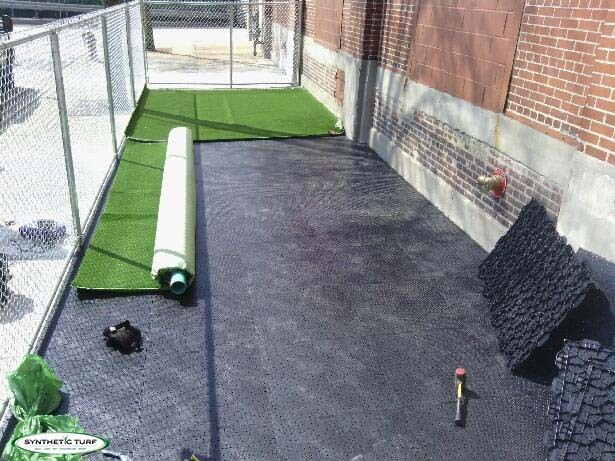 Our DuraFlo backing provides for not only the best draining turf on the planet, it is also the most durable and will not expand and contract like black or green urethane backings do. Our backing is made to be on the ground and made to last! It will NOT hold any moisture or urine smell and is our “secret weapon” (so-to-speak). It is what truly sets up apart from others! There truly has never been a better solution to the muddy paw problem associated with foul weather. Artificial pet turf is the answer. Everything drains right through it either into our compacted stone base our optional drain-able sub-panel system which is ideal for roof-tops, decks, patio’s and concrete. 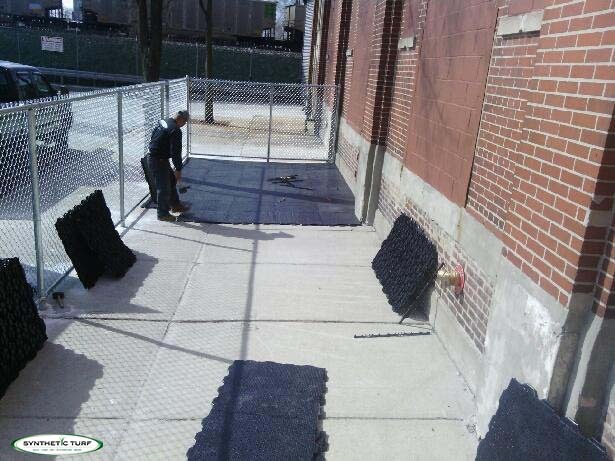 Our Modular Sub-Base Panel System allows for optimal drainage and allows the turf to be securely fastened down. 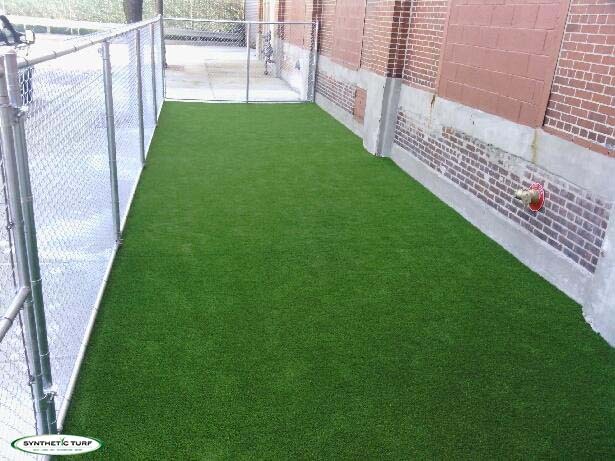 The sturdy, yet slightly flexible base panel along with our Supreme Pet Turf is the ideal solution for dog runs, condos, Dog day-care facilities, kennels, back-yards, rooftop spaces… the options are endless! Call or email us today with the dimensions of your space for your free estimate!